Back in Nerf land once again, checking out yet another of their latest blasters. This time we've been playing with... ahem... seriously testing something from the Modulus range; a group of blasters designed to be modified, changed, and combined to your heart's desire. It's called the Tri-Strike, so let's lock and load! So, the base blaster is a chunky pistol that shoots one dart at a time, drawn from the included ten-dart clip. You slap in the clip from the underside, draw back the orange primer (with a knob on each side – tee hee), push it back, and shoot. As a standalone pistol it is pretty good, despite being fairly large. The sights are good, it shoots relatively straight, and is capable of 'slam firing', whereby you hold down the trigger and pump the primer to shoot all ten darts quickly. Clipping onto the nose of the pistol is a barrel extension with a very wide grip to make the Tri-Strike a two-hander. But that isn't all, as contained in that forward section are four MEGA darts which can be shot off by firmly pumping the big grip. The darts load down the barrel, so there isn't a clip or magazine for this section of the blaster, but it does feature a very clever mechanism whereby it 'knows' which barrels contain a dart, so even with only one dart loaded, it will always shoot first time round. The reason we said “...kinda” earlier is because, although the forward section can indeed shoot those four darts when not attached to the pistol, its a bit ungainly and awkward to do so. What isn't awkward is firing the rocket launcher. Included along with one of the large rocket darts, previously seen with the Demolisher a couple of years back, the two sections of the rocket launcher can be conjoined to create a stand-alone single shot blaster that shoots with a plunger-like stock. 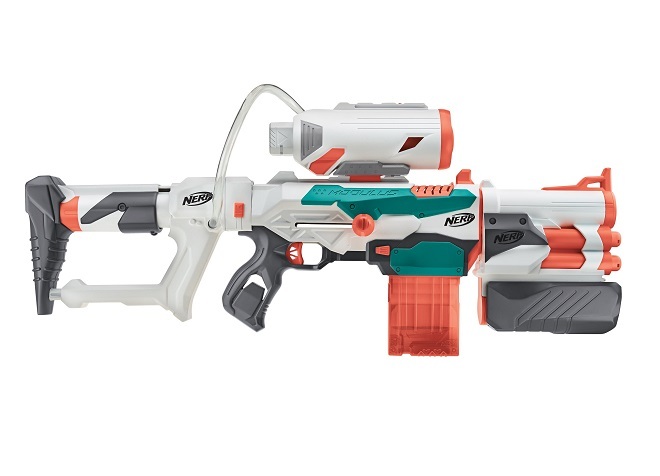 It is a blaster in it's own right, and the rocket section even has a tactical rail to attach accessories like a sight or another kind of smaller blaster. 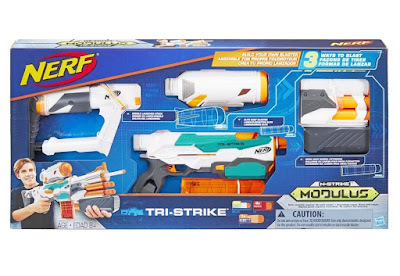 Detach the stock from the rocket launcher, and then bolt it to the back of the pistol, with the launcher sliding onto the top side rail; now you have your complete Tri-Strike. Combined, it's a pretty big thing, and despite being made up of removable sections it is nicely robust. All three blasters can be fired really easily and in the hand it feels like a very aggressive and intimidating thing. In firing? Well we were pleased to see the main pistol performed very well, with decent ranges of between 50 and 60 feet. The rocket launcher shoots as far as you can manage, as the plunger needs a fair amount of wallop to break 20 feet or so. We've never reviewed these large rocket darts before, but can only assume they are intended for closer range combat as a result. Meanwhile, the forward MEGA dart shooter was something of a disappointment. When pumping the grip the first two fire off with impressive power, reaching distances of around 30-35 feet, but the last two always fell far shorter. It might have been that the one Hasbro sent us was slightly defective, with perhaps some kind of air leak in the smart mechanism, but we found ourselves intentionally removing that section when in battle. 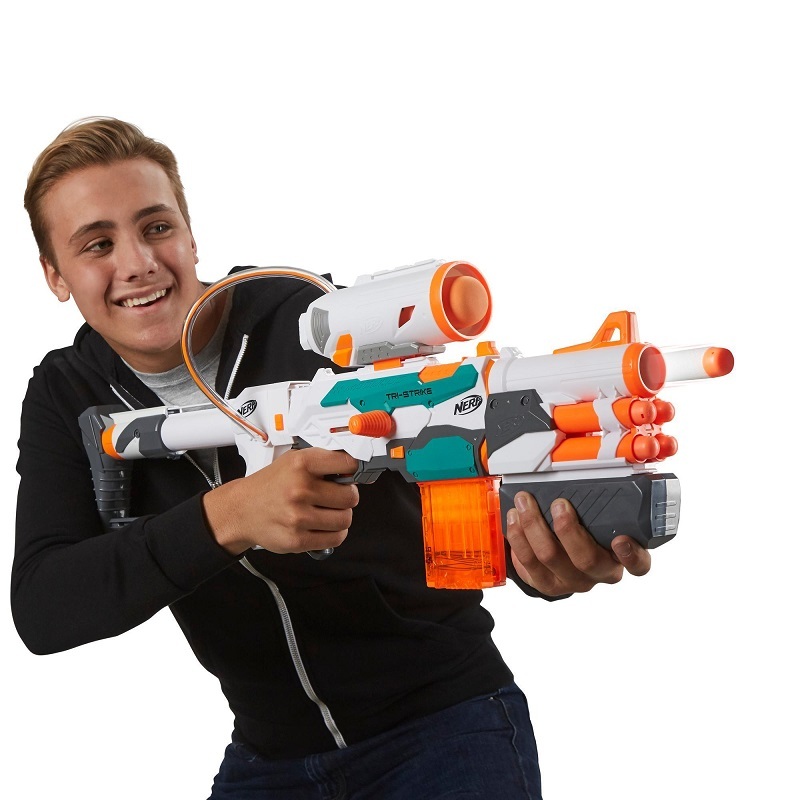 And hey, with just the rocket launcher attached to the pistol, the Nerf Tri-Strike looks pretty badness and performs well, and we love the white and orange colourings of both blaster and darts. In play, we swapped out the ten dart clip for the 24 dart drum that came with the Hyperfire (which means slam firing is a lot more fun), while we also stuck on the barrel extension and fore grip of the Retaliator. Tactical as F! From what we can tell, the Tri-Strike is what the Nerf Modulus range should be all about – complete blasters with removable parts to interchange with others, not necessarily from the Modulus range. As springers go it is powerful, easy to operate, and looks 'da bizzness'.